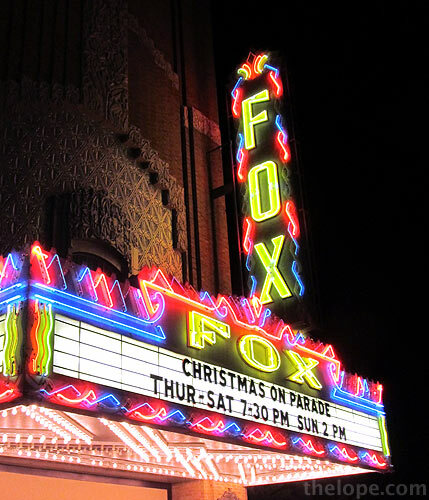 The Fox Theatre in Hutchinson, Kansas, is the venue for "Christmas on Parade," a live variety show performed by the Hutchinson Theatre Guild. Show times are Thursday through Saturday at 7:30 PM and Sunday at 2 PM. Tickets are $10 for adults, $9 for seniors and $8 for kids 12 and under. I was test driving a new Canon point and shoot, the SX130. It shoots HD videos but lacks the video manual exposure and audio gain controls of its more expensive cousins. There's not even a wind filter, so one would be advised to experiment with foam or sponge material over the microphone holes. Still, this is an improvement over the non-HD video capabilities of it's predecessors, the SX110 and SX120. Look out for some flaring from very bright light sources, though.